LEN - www.lankaenews.com | President seeks cabinet approval for a Rs. 20 billion corrupt tender bid under investigation at FCID and Bribery Commission ! 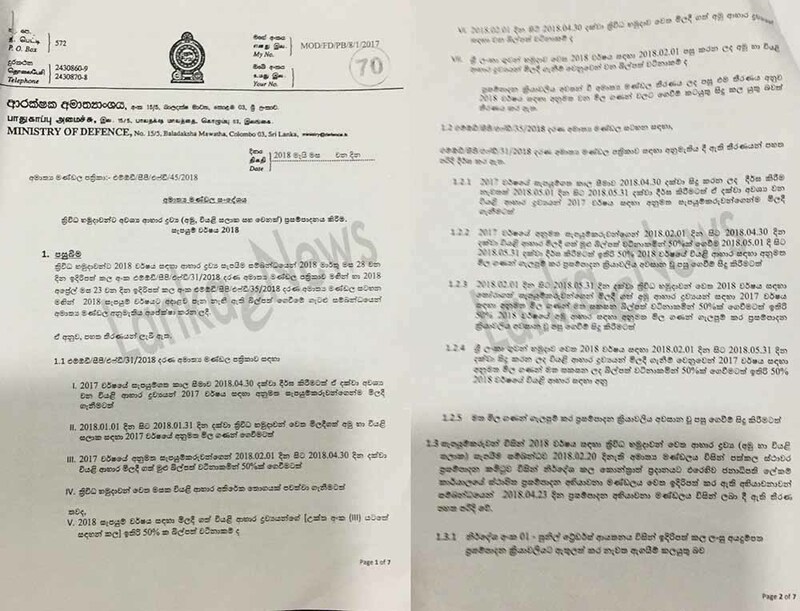 (Lanka-e-News - 24.May.2018, 11.45PM) While the tender for the supply of food to the security forces for the year 2018 has been confirmed as absolutely corrupt , and complaints have been made to the Bribery and Corruption Commission as well as the FCID in that regard following an adjournment debate in parliament , yet most shockingly and unbelievably , president Gamarala the highest in the hierarchy of the country himself has presented a paper to the cabinet on the 21 st to get approval for this most corruption tainted tender. (The relevant section of the cabinet paper is herein ). What is even more shocking is ,this is a tender which involves a sum of over Rs. 20,000 million ( Rs.20 billion !) which is in excess of the amount last year by a whopping Rs. 3000 million! Fortunately, this corruption ridden tender of the president was not approved by the cabinet on that day though the president tried to steer it forward with vim and vigor by submitting a cabinet paper. Gamarala beats Rajapakses‘ inglorious records ! 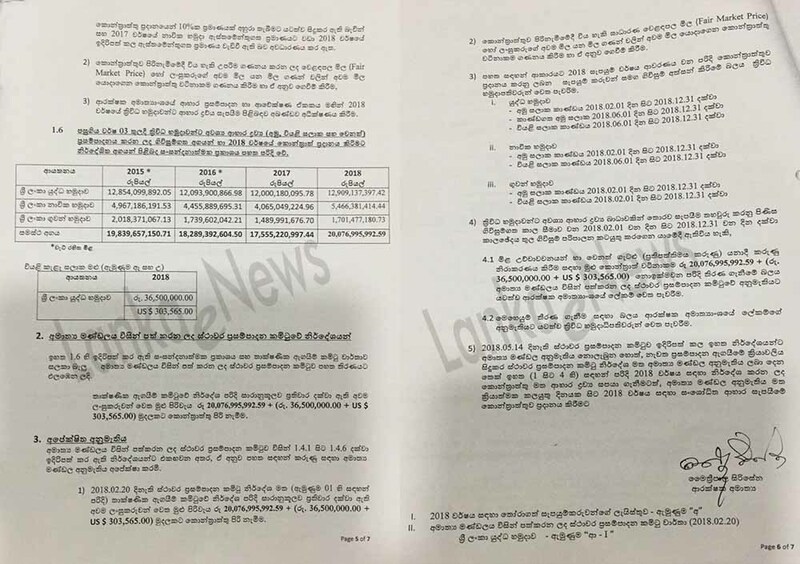 As Lanka e news pointed out in its reports earlier on , though this tender should have been concluded by 31 st December 2017 ,this corrupt controversial tender had been dragged on into this year (2018) , and even after 5 months have elapsed this year , it had not been possible to arrive at a final decision on it. This is solely and wholly because of the sly plans to collect bribes via this tender by the infamous crooked bribe taker group of the president were foiled , and they therefore making attempts to explore every other available avenue to somehow achieve their dastardly and diabolic designs. It is because Buddhika Pathirane M.P. lodged complaints with the Bribery and Corruption Commission as well as the FCID , and the COPE Committee too making a request , the Auditor General is conducting a separate investigation . 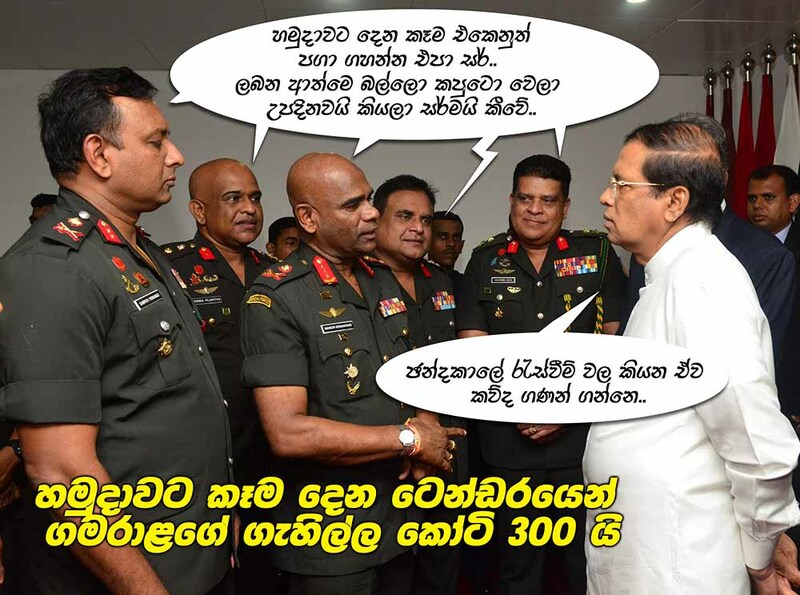 Even during the most notorious corrupt regime of Rajapkses while the war was on and forces had a bigger number of members, never did the tender for the supply of food exceed Rs. 2 billion . Therefore Gamarala has broken that corrupt record too to the detriment of the country. As soon as this government was installed in power , with the halting of bosom pals of corrupt Rajapakses alone making tender bids , and allowing anyone to take part in the tender bids , in 2016 , the tender bid could be reduced by about Rs. 1550 million which meant , until that time that amount was pocketed by the ‘Rajapakse regime’. But now shockingly , the tender bid has shot up by about Rs. 3000 million , and the full tender amount now in the grip of ‘Gamarala regime’ has exceeded Rs. 20 billion ! It is significant to note , in the cabinet paper presented by Gamarala on the 21 st , in addition to the tender bid being corruption tainted, he shamelessly and despicably had moved heaven and earth to get approval for this corrupt endeavor. This is the modus operandi.. Calling for tender bids first comes under the purview of the Procurement Board. Subsequently , it is turned over to the Technical Committee . Based on the latter’s recommendations , the procurement committee awards the tenders to the deserving bidders. However in this instance the Procurement board had not abided by the recommendations of the Technical committee, and awarded the tenders to their favorites and cronies , owing to which those genuine bidders who were deprived had turned rebellious. 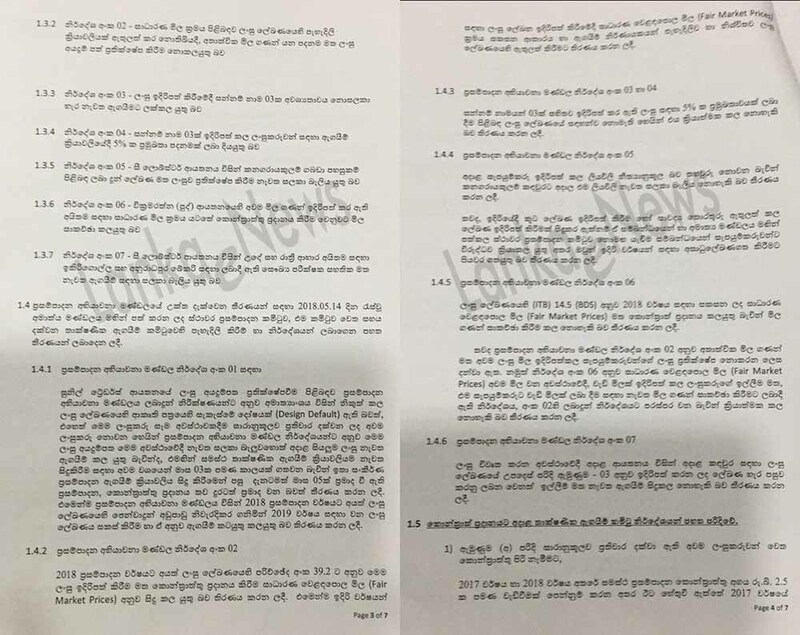 The defense concocted by Gamarala’s two stooges , namely Waidyaratne the defense secretary , and Ms. Kamani Hettiarachchi the accountant was , the low tender bids of the deserving bidders were not reliable. In this connection the appeal committee in the defense ministry was requested to investigate and deliver a decision. Accordingly , the appeal committee delivered a verdict that the decision of the procurement board was erroneous. Gamarala’s moronic explanation after kicking off the appeal .. This is the biggest joke of the century. Anywhere in the world when a decision given is heard in an appeal , and if in the appeal a verdict is delivered , it is the decision based on the appeal that is followed , and not the earlier decision. However according to our president Gamarala Sillysena , it is not the decision of his own appeal committee but it is the previous decision of the procurement board that should be followed. If that is so , why on earth is he having an appeal committee ? Is it to hear the appeals made by the lunatic pals of Gamarala’s loony bin from which he alone has managed to escape ? By analogy , this is akin to Sillysena saying , though the appeal court decision is delivered, it is the earlier High court decision which overrides. Gamarala ‘s camouflage tactics in relation to the cabinet paper unfolds another story . Under 4.1 and 4.2 of page 6 ,this camouflage is tantamount to a massive crime. Yet the request has been made to bring this tender process under the defense secretary with the approval of the procurement board , and its operation under the commanders of the forces with the permission of the defense secretary. Nothing can be more ridiculous and ludicrous than this. The Procurement board is under the defense secretary , and the commanders of the three forces are members of that committee. That means Gamarala has duped the cabinet by requesting it to entrust the task to the same group while using different names. In the ‘charming’ cabinet paper of Gamarala , its tail end – the fifth part of page 6 is most fascinating. It says , if the approval cannot be granted to this tender (corruption tainted), without following the old prices of 2017 , to give the approval only to the part that is corruption tainted , and if necessary let the whole tender process be commenced again. If that is adhered to , since half the year 2018 is almost over , it will not be possible to remedy the tender process until this year is out. That is , tenders will have to be called for the year 2019. Besides , while being fully aware the whole scenario is corrupt, isn’t it absolute madness to request to give approval to a part of it ? In the circumstances , can there be a more self degrading and shameless president on this planet ? The only reasonable inference that can be drawn from these donkey antics and monkey acrobatics of Gamarala is , he has no ability to rule this country , and he only excels in committing daylight robbery through tenders.